Belarusian state-run Channel 1 regularly covered the ongoing conflict in Ukraine. Journalists have often referred to the participants of protests and the opposition as radicals and extremists. Reporters blamed Western politicians for the situation in Maidan. Reporters blamed Western politicians for the situation in Maidan. “Maidan” appeared also in the context of state officials-small businessmen talks with the Head of State. Lukashenka warned the Belarusian business from getting involved into some counter-activities. Belarusian ONT TV channel organised a discussion about the forthcoming elections to local authorities. The programme featured representatives from state and opposition politicians. Situation in Ukraine is getting worse. The Ukrainian authorities agreed on amnesty for the participants of the protests, but only if the opposition would leave the government buildings they had seized. However, the city is getting ready for a new wave of unrest. A journalist from the Ukrainian newspaper “Vesti” was shot on the street by a group of unknown people. 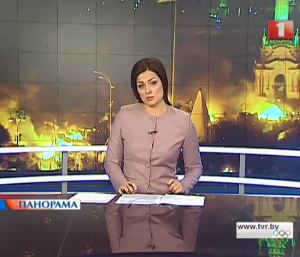 “Last night (18 February – BD) became the most bloody in the history of independent Ukraine”, the newscast pointed out. As a result, 26 people died, and at least 10 of them were policemen. The opposition is clearly not ready for talks, Belarus state TV journalist stated. The European politicians ignored the outrageous actions of extremists and blamed only Yanukovich for all that was happening, he continued. “Although any hope that under the red and black black flags of ‘banderovcy’ democracy will come to Ukraine, is, in the least, a silly idea”, the state journalist commented based on the opinion of unnamed experts. Kiev: the political crisis affects the economy. The opposition fraction of the Ukrainian Parliament cannot agree on key questions of the Constitution reform. The international agency Fitch downgraded the credit rating of Ukraine. Moscow: the West is guilty of the Ukrainian crisis. Journalist noted that the leaders of the opposition went to Berlin. They asked the European Union to impose sanctions on the Ukrainian authorities and the German chancellor for financial support. “Ministry of Foreign Affairs of Russia called the disorder in Kiev a result of politics of the West,” journalist concluded. The Western democracies violate human rights. The Ministry of Foreign Affairs of Belarus published its annual document on 23 countries that violated the human rights in 2013. State TV commented that it described predominantly the cases of racial hostility and discrimination in the countries of the European Union. “A real wave of Nazism has swept over Europe. Manifestations of xenophobia are practically in all countries, even in the places that suffered from the red plague: Lithuania, Poland, Greece, France and Germany”. The publication of the Belarusian MFA referred to the countries which supported sanctions against Belarus due to the alleged human rights’ violations. “The staff of the MFA stresses that there are no perfect countries. Problems should be discussed rather than become a tool for pressure.” The unique feature of this Belarusian report is that it does not contain any conclusions, but presents only facts, the state TV reporter concluded. Lukashenka: the industrial park is drowning in bureaucracy. Alexander Lukashenka chaired a meeting on the construction of the Belarusian-Chinese technology park in Belarus. The Head of State harshly criticised the officials for delays in its realisation. Lukashenka said, “There is everything necessary in place to have such a plant in Belarus. There is stability in the state, which is absent in other countries.” Kiril Rudny, Lukashenka’s advisor, also raised some financial controversies around the project, such as the interest-rate of a loan from Beijing. Throughout the state TV coverage, Lukashenka shouted at different officials for the slow pace of construction and demanded explanations from them. One reporter pointed out that according to experts, in a long-term perspective, the project could bring billions dollars in the form of investment to the country. Lukashenka: no “Maidan” in small business. Lukashenka chaired a meeting with officials and businessmen. They discussed the proposal by the government introduction of the obligatory certificates on the quality of goods. “This is a right thing to do. But not everybody is ready to reject their own shady schemes,” the state TV journalist notes. The Head of State referred to criticism on changes from the Belarusian business community. “It is pointless to threaten me. We will not allow a “Maidan” to happen in our country. Everything will unfold in a civilised manner.” In response, he warned against businessmen getting involved in any reactionary measures against the planned policy's implementation. An ideal candidate for the local authorities: According to state TV, gender does not matter, the most popular candidates are doctors, teachers and social workers, ideally between the age of 45-55 years. Income plays an important role as well. Unemployed candidates do not have a very good chances, and those with a higher income also arouse suspicion. “If you are successful in business why are you trying to gain political power?”, the state TV journalist asked rhetorically. Belarusian voters pay attention to the experience where their candidates work, but also the biography of their candidates. “People do not vote for strangers and do not trust populists,” the reporter comments. In its coverage, state TV presents the profiles of two members of Bielaja Rus, a government organised non-governmental organisation. Debate on the local elections. Recently state-run ONT TV site covered of the local elections scheduled to take place in March. The show gathered both representatives from the authorities, but also a few opposition figures. It demonstrated that the Belarusian opposition had access to state media and can freely promote itself. The head of the Central Election Committee Lidzija Jarmoshyna noted that “some political forces abuse the system by using their right to boycott.” According to Valery Uchnaliou from the party “Spraviedlivi Mir” citizens should not boycott, but rather exercise their electoral rights. If they do not like the candidates, they should vote against all of them. Uchnaliou argued that the amended electoral law still has not addressed all the standing issues, including the apparent pluralism of the members of the electoral committee, but also securing a transparent and open vote-counting process. Jarmoshyna explained that diverse social forces would be represented in the electoral commissions, including civil society, state officials and citizens. Belarus and the Outside World: From Isolation to Co-operation? Few foreigners come to Belarus from the West. The Belarus-EU border itself appears to be tightly guarded, but the Eastern Partnership summit in Vilnius raised hopes for improved visa facilitation. Is Belarus at long last opening up? A typical summer day on Independence Square in central Minsk: Several tourist groups gather around their tour guides and listen to stories about the sights of the Belarusian capital. Very few of these tours will be held in a language other than Russian, because larger groups of tourists come only from Russia and other republics of the former Soviet Union. Often these guests come in search of lower prices, a casino and maybe a bit of Soviet nostalgia. The number of visitors from Western Europe remains low. Take the example of Germany. Germans like to travel. Worldwide, only the Chinese spend more money on tourism than Germans. There are only 600 km between the borders of Germany and Belarus. Not an overly large distance as a glance at the map of Europe reveals. Yet, only an average of 4,500 Germans travels to Belarus each year. They include tourists, businessmen, aid workers, diplomats – all added together. To put this number into perspective, the same number of Germans fly to the Mediterranean island of Mallorca – in a single day. Also outside of tourism, relatively few people from other countries visit Belarus. Therefore personally meeting foreigners is not an experience that too many Belarusians encounter on a regular basis – if at all. 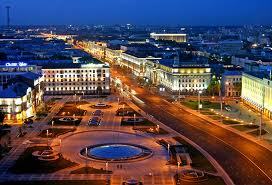 In Minsk the sound of foreign languages is not very familiar to its inhabitants. While other capitals of the region – like Kiev or Vilnius – see many more foreign visitors, Minsk is rather different from those capitals. Those communicating in a foreign language in Minsk certainly stand out and often catch the attention of the surrounding crowd. In terms of tourism, Belarus certainly lacks spectacular ocean shores nor does it have any high mountains to offer. But visitors can enjoy plenty of untouched nature and a number of old cities and monuments. Still tourism remains a small niche for the Belarus' economy. Only a limited number of tourists want to explore a blank spot on the map of Europe, which is precisely what Belarus is for many in the West. What's more, Belarus is also not a cheap destination. Even avoiding the premium hotels in Minsk – like the Crown Plaza or Europe – it is still difficult to find a room for under €100 a night. The hotel-sector in most of Europe sees a lot of competition. Compared to the standards they offer, even Minsk's cheaper hotels – such as Tourist or Arbita – are quite expensive. For those travelling on a very tight budget, very few hostels exist so far. Another potential foreign group could be students. Life in Minsk is cheaper than in Moscow or St. Petersburg. The Belarusian capital has therefore become somewhat popular for students of the Russian language. But a major obstacle for more exchange is that Belarus is excluded from the list of Bologna-countries. While the Bologna process aligns the standards for higher education throughout the rest of Europe, Belarus sticks to its own national rules and regulations. Beyond tourism or student exchanges, permanent migration to Belarus remains an even bigger challenge. Other than some elderly Russians who find it easier to live on their pension here, few people settle in Belarus permanently. It is no surprise that low wages do not attract migrants. Belarusian society presents itself as relatively closed and is much more conscious in trying to actively maintain its homogeneity. Taken on the whole, Belarus is still a country that is still struggling with its own a nation-building process. Categories such as ethnicity and the nation-state are still very relevant for Belarus. Integration and the question of whether immigrants contribute to Belarusian society are not an issue, as there is almost no one to integrate. On the other hand, Belarusians are very eager to meet foreigners. Many Belarusians study foreign languages and look for opportunities to practise them. Once spotted, a foreigner can easily find himself approached by the locals. Even on the streets or in a trolleybus. Out of sheer curiosity people may address someone from another country. Especially if the visitor is from a Western country. Due to somethat that may be somewhat accounted for as an inferiority complex, some Belarusians may express their surprise that someone from the West would come all the way to their country. A “real foreigner” can even land an invitation at the home of people who usually do not have foreign guests sitting on their table. And with Belarusian hospitality, a foreigner – just like any other guest – will certainly not leave the house without having tried plenty of all the food available, with the spread always being plentiful. Indeed, it is not all bad news. Minsk does have a growing international community. Professionals, students, volunteers or interns come to Belarus. People from all parts of the world mix and mingle in Minsk. Even those who come from countries that do not share a border with the country, such as Venezuela. Minsk – and Belarus as a whole – is certainly opening up and becoming more international. Many pupils in Belarusian schools not only study English or German but also Chinese. At the same time Belarus and China plan a huge industrial park near Minsk. Soon Belarusian kids will have plenty of opportunities to practise their language skills. Also an increasing number of young Belarusians study abroad or participates in trainings, youth exchanges and programmes like the European Voluntary Service (EVS). The Eastern Partnership summit at the end of 2013 seemed to have made room for improvements with the EU-visa situation for Belarusians. Those returning to Belarus also regularly share their experiences from abroad. It should also be taken into account that Minsk's infrastructure is contiously changing. It may still be quite an adventure to buy a ticket at Minsk's main train station without at least basic Russian. But more and more English-language signs are popping up to provide directions around Minsk, though some remain a bit enigmatic for Western visitors. Unless they are looking for places like the “Mass Entertainment Area". And the doors of many metro stations already reveal that this uvakhod is in fact an entrance and that it is a local custom to “Please Hold the Door Open”. Furthermore a red double-decker bus is now available to take tourists on a sightseeing ride around Minsk. A big milestone for tourism in Belarus will clearly be the Ice Hockey World Championships in May. The event will hopefully bring many foreign visitors to see for themselves what Belarus has to offer and establish people-to-people contacts with Belarusians. Thomas Bergmann served in the European Voluntary Service in Minsk in 2012/2013.